PHILADELPHIA (AP) — Jordan Clarkson scored 14 of his 19 points in the fourth quarter, Rodney Hood had 25 points and the Cleveland Cavaliers stunned Philadelphia 121-112 on Friday night, ending the 76ers‘ 20-game home winning streak. Colin Sexton added 23 points, Cedi Osman had 20 and Tristan Thompson had 18 points and 13 rebounds for the Cavaliers. Joel Embiid had 24 points and 12 rebounds for Philadelphia, which had won four in a row overall. OAKLAND, Calif. (AP) — Kevin Durant scored 32 points, Klay Thompson had 31 and Golden State snapped its worst losing streak since early 2013 at four games, beating Portland. Durant was 13 of 21 from the field, dished out eight assists, had seven rebounds and three of his team’s 11 blocks. Thompson hit five of his first seven shots and grabbed a season-high eight boards for the undermanned two-time defending champions. Two-time MVP Stephen Curry, in a car accident earlier in the day that left him uninjured, sat out again with a strained left groin and fellow All-Star Draymond Green also remained sidelined because of a sprained right toe. Jusuf Nurkic had 22 points and eight rebounds for Portland on a night Damian Lillard shot just 9 of 24 for 23 points and eight assists. CJ McCollum added 19 points and five assists. LOS ANGELES (AP) — LeBron James had 22 points, 10 rebounds and seven assists, and he seized control of an ugly game with nine points in the fourth quarter of Los Angeles’ seventh win in eight games. Brandon Ingram scored 24 points while the Lakers struggled in their first game back from an Eastern Conference road trip, committing 24 turnovers and managing just 10 assists all night. Neither team took a commanding lead in the second half until James hit a layup and a 3-pointer on consecutive possessions with 3:15 to play. James then blocked a shot by Alec Burks in the final seconds as Los Angeles held on to snap its seven-game skid against Utah. Donovan Mitchell scored four points before he bruised his ribs in the second quarter and didn’t return, depriving the Jazz of their top scorer. TORONTO (AP) — Kawhi Leonard had 27 points and 10 rebounds, Kyle Lowry scored 15 points and Toronto won its fourth straight game, beating Washington. OG Anunoby scored 15 points and Fred VanVleet had 13 as Toronto posted its third straight win over the Wizards and improved its NBA-leading record to 16-4. The Raptors are 10-0 this season against teams with losing records. Bradley Beal scored 20 points and Otto Porter Jr. had 17 for the Wizards. OKLAHOMA CITY (AP) — Russell Westbrook had 30 points, 12 rebounds and eight assists and Oklahoma City held off Charlotte. Dennis Schroder — paired with Westbrook in the starting lineup for the first time this season — scored 23 points, and Paul George added 17 points, seven rebounds and six assists. Oklahoma City has won 12 of 14 after an 0-4 start. Kemba Walker had 25 points and eight assists for Charlotte. MILWAUKEE (AP) — Jamal Crawford made a jumper with 0.8 seconds left to lift Phoenix past Milwaukee. Giannis Antetokounmpo had 35 points for Milwaukee. DETROIT (AP) — Reggie Jackson scored 19 of his 22 points in the fourth quarter and overtime to help Detroit beat Houston. Blake Griffin scored 28 points, and Andre Drummond had 23 points and 20 rebounds. The Pistons have won five of seven. James Harden scored 33 points for the Rockets, who had won five straight. Clint Capela had 29 points and 21 rebounds. ATLANTA (AP) — Aron Baynes scored a season-high 16 points, Jayson Tatum added 14 and Boston beat Atlanta to snap a three-game skid. Boston, which had lost seven of 10, used a 45-point first quarter to put it out of reach early. Jeremy Lin led Atlanta with 19 points, and Alex Len added 17. 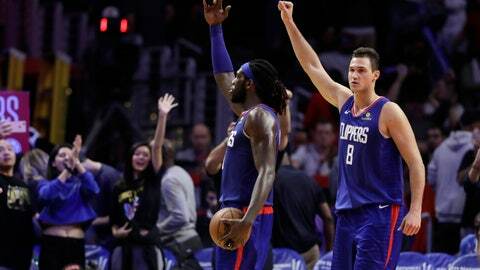 LOS ANGLES (AP) — Danilo Gallinari hit three free throws with 3 seconds left to tie it in regulation and finished with 20 points, Montrezl Harrell had 22 points and Los Angeles ended Memphis’ five-game winning streak. NEW YORK (AP) — Derrick Rose scored 25 points, Karl-Anthony Towns had 21 points and nine rebounds, and Minnesota beat Brooklyn. Rose was 11 for 17 from the field, helping Minnesota get back on track after dropping two in a row. Taj Gibson had 16 points and 11 rebounds for the Timberwolves. Joe Harris and Spencer Dinwiddie had 18 points apiece for the Nets. NEW YORK (AP) — Emmanuel Mudiay scored a season-high 27 points, rookie Alonzo Trier had a career-high 25, and New York rallied to beat New Orleans. Trier made two free throws to put the Knicks ahead 104-103, and they held on to win consecutive games for the first time this season. Anthony Davis had 33 points and 12 rebounds for New Orleans. DENVER (AP) — Trey Lyles scored a season-high 22 points, Mason Plumlee had 15 points and 11 rebounds, and Denver beat Orlando. Nikola Jokic finished with 11 assists and 10 rebounds but fell four points shy of a triple-double. It was the third time this season Jokic missed out on a triple-double because he failed to score 10 or more points. Terence Ross led Orlando with 18 points. CHICAGO (AP) — Josh Richardson scored 12 of his 27 points in the fourth quarter and Hassan Whiteside had 18 points and 10 rebounds to help Miami beat Chicago. Zach LaVine got the Bulls to 87-84 with 6:07 left, but Richardson had back-to-back baskets and Wayne Ellington answered with a 3. Richardson made his fifth 3 to put the Heat up 100-90 with two minutes to go. Justin Holiday had 27 points and 13 rebounds for the Bulls, and LaVine added 24 points. INDIANAPOLIS (AP) — LaMarcus Aldridge had 33 points and 14 rebounds to lead San Antonio past Indiana. DeMar DeRozan had 16 points and six assists, and Patty Mills added 15 points for the Spur. Bojan Bogdanovic had 21 points, and Domantas Sabonis had 19 points and 16 rebounds for Indiana.